This page provides you with Software Engineer resume samples that you can use for inspiration in writing your own resume, or for creating one through our easy-to-use resume builder. Below you'll find our how-to section that will guide you through each section of a Software engineer resume. As a software engineer, you are well aware that this highly competitive field requires a standout resume: employers make a split-second decision about whether your resume deserves a second look or not, and you need to be prepared for that! 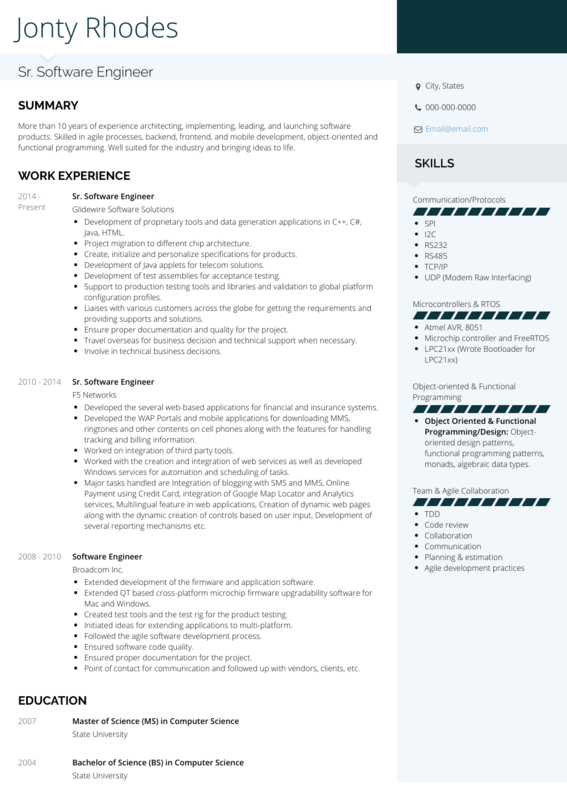 It is not easy to create the best software engineer resume sample! You may be fantastic when it comes down to code writing or designing softwares, but let’s be honest: writing the perfect software engineer resume is completely different! Don’t worry though, we have helped many software engineers like you get the job they had been dreaming for, thanks to our professional resume samples that have been trusted by over 3 million people all over the globe. Let us inspire you with the best resume tips you could ask for! Most software engineers like you possess an impressive arsenal of skills with an extensive knowledge in mathematics, physics, and other analytical disciplines. You have the experience, the education and the willingness to work hard to get to the next level, but the fierce competition requires you to build an engineering resume that stands out from the pack. Let’s get straight into it, then! First of all, we strongly suggest the reverse-chronological layout: it is the perfect option to highlight your strengths and to show your top achievements. Make sure you use clear and legible fonts and headings, allowing plenty of white spaces to create an enjoyable reading experience for the recruiter. What has also worked very well for other software engineers we have worked with in the past is the “Personal Projects” section: it is a unique and must-have brief paragraph that will definitely strengthen your application! Generally speaking, don’t forget that attention to detail and accuracy are two fundamental skills that employers automatically expect from professionals like you: avoid typos or any other kind of mistakes in your resume. Finally, it’s important to remind you to save your resume in PDF format to keep your layout tidy and clean: we don’t hate Microsoft Word, but we want to give this your best shot! This section of the resume is your initial pitch to get the attention of the recruiter. In less than 15 seconds, the quality of this paragraph will determine whether you deserve a second look or not. This section answers one of the easiest, yet most complicated interview questions: Tell me about yourself. Highlight your top selling points that specifically fit the job description. Showcase your best achievements and be proud of them! Be as specific as possible: you want to be unique, special, recognizable. Don’t be generic Don’t fill your resume with technical terms: it’s fine to have a few, not a few hundreds! Do not oversell yourself! Do not sell yourself short either! First of all, congratulations! It is always a remarkable achievement when the recruiter makes it to this section of the resume - definitely much better than getting shot right into the bin by a Kobe Bryant recruiter! Don’t celebrate too soon, though, because this section is as important as the others. You could easily lose the trust of the employers if you do not fill this section carefully. Our tips below have helped many software engineers get to the next level: you are next, my friend! Education matters, no matter what, as long as you are good at storytelling and you succeed at highlighting how fundamental that period of your life was for your professional success. Following this, we strongly suggest you include 3 or 4 college achievements that have molded you and that also fit the current job description. While your recruiter will most likely not be interested in your part-time job at the school restaurant, you might get her attention by showcasing the engineering podcast you have worked on for two years or those articles you were able to get published on the university magazine. A new era has begun years ago, when a new digitized version of candidate screening through a digital search for specific keywords will easily make your wonderful resume overlooked if it does not contain those keywords the employer is looking for. Don’t worry, though, we know all the secrets and we are ready to share them with you. First, list the master list of every single skill you have, obviously related to your experience as a software engineer! Please take your time on this personal brainstorming and make sure you include soft skills, hard skills, any professional skill at all. Don’t forget, hard skills are job-specific and include all the knowledge you need to perform a job. Soft skills, on the other hand, are interpersonal skills. Ok, have you listed them all? All you have to do now is to match those with the skills list from the job description! A great cover letter that match your resume will give you an advantage over other candidates. View some real-world examples here. Finally, if you are looking for the best software engineer resume templates, you should check these masterpieces we have been working on here : many professionals like you have successfully used it to take their career to the next level.